Senior Sales Staff Mark Warner shows a bump stock installed on an AR-15 rifle at Blue Ridge Arsenal in Chantilly, Virgina, on Oct. 6, 2017. 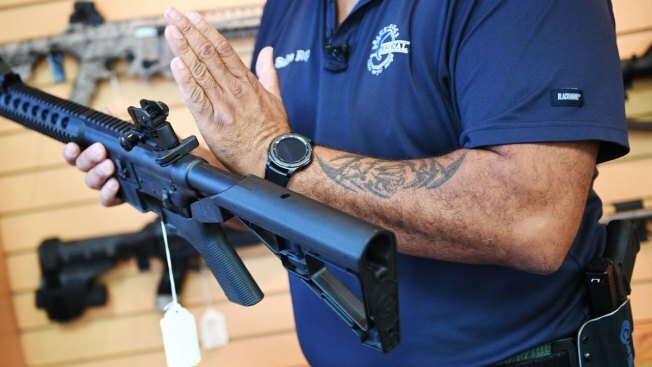 Maryland would ban devices that can increase a semi-automatic rifle's firing rate, under a measure that cleared the state's House of Delegates on Thursday night. The bipartisan vote was 128-7 to ban bump stocks, which can make a semi-automatic rifle's firing rate to nearly fully automatic. The measure now goes to the Senate where similar legislation is moving forward. Del. David Moon, a Democrat who sponsored the measure, described it as a way to close a loophole in Maryland's sweeping 2013 gun-control law that banned 45 assault weapons. "Today we are sending a simple message that you cannot jerry-rig your way around our assault weapons ban,'' Moon said after the vote. Del. Nic Kipke, the Republican minority leader, also supported the bill. "I believe that this is the commonsense thing to do,'' Kipke said, adding that he hoped lawmakers would approve measures to take people who commit repeat violent crimes off the streets. Bump stocks were used in the mass shooting in Las Vegas last year that killed 58 people and wounded more than 800. The bill is one of several gun measures that are advancing in the General Assembly. Under another bill passed by the House Thursday night, judges could order people to temporarily give up their weapons, if they are found to pose an immediate threat. That measure passed on a bipartisan vote as well 116-17. The House also passed a bill 127-7 to create a process to ensure gun owners convicted of domestic violence surrender their guns.